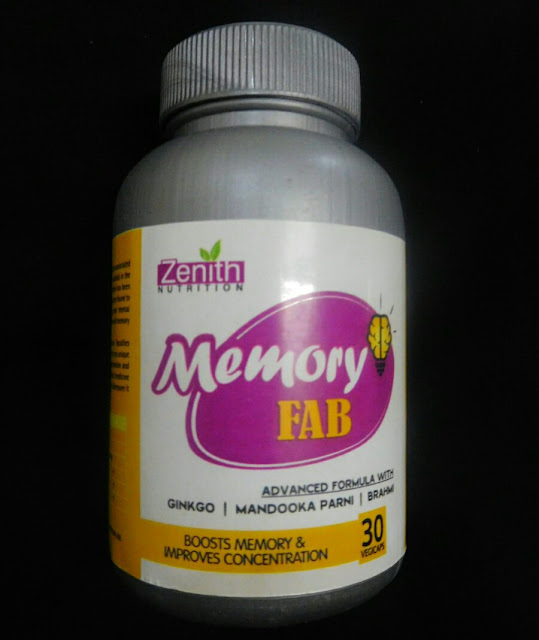 Zenith Nutrition MemoryFab Capsules Review! 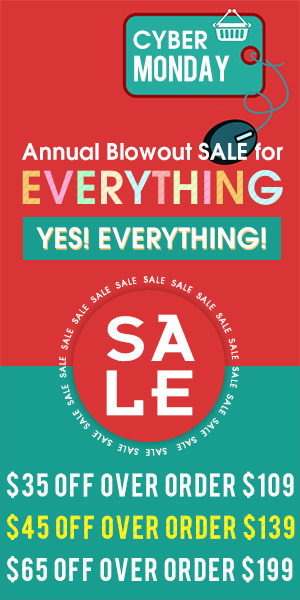 - Indian Beauty Network and those posts were highly appreciated by all of my readers. Like I mentioned earlier, Health is something I take seriously, since I'm a doctor. I keep in mind and preach this all the time as well: Health is wealth. Taking supplements early ensures that you stay fit and healthy during the later stages of life. Well, without getting ahead of myself, I'll be introducing you guys to the Zenith Nutrition's MemoryFab Capsules. Let's get to the review! AVAILABILITY: Available on Zenith Nutrition.com and Amazon. Ginkgo helps improve memory,especially occasional mild memory problems associated with aging. Ginkgo contains antioxidant properties that help fight free radicals in the body. Free radicals may contribute to the premature aging of cells.Brahmi has been found to be very beneficial in anxiety neurosis and mental fatigue. It has been found to significant improve IQ levels, general ability, behavioral patterns and mental concentration in children. Brahmi is useful for improving mental clarity,confidence and memory recall. DOSAGE: As directed, take 1/2 tablespoon or 2g OR as directed by your physician. INGREDIENTS LIST: Methyl Paraben, Propyl Paraben. I have noticed a lot of people have called their wives or wives who have called their husbands this one word: Forgetful. It's quite common since there are hundreds of things that need attention and time and it's not possible to give our energy to each task and sometimes, because of that, we forget stuff. But if you ever think that this has become more of a habit, then it becomes a problem, or even a nightmare at times. I personally forget things a lot and I am reminded at the last minute about them. It gets really scary since there are things of utter importance and there is a lot of chaos when they're not done. So, the Zenith Nutrition's MemoryFab Capsules are quite handy at this time. The Capsules are easy to swallow and ensure that your brain stays put at all times. Ofcourse, they don't work instantly but the effects are pretty good, according to me. It really promotes better concentration and helps your brain to stay focused. It comes in a classic packaging with a tightly sealed cap. The cap ensures that the medicines stay fresh inside the container. The cap can be twisted opened easily. It's quite easy to carry as well and doesn't take up much space in the cupboards. PRECAUTIONS: Pregnant or lactating women, diabetics, hypoglycemics, and people with known medical conditions and/or taking drugs should consult with a licensed physician and/or pharmacist prior to taking dietary supplements. RESULTS: I'm becoming less forgetful everyday, and besides that, I feel calm, composed and much relaxed. I'm able to focus quite well too. Ingredients ensure brain boosting benefits. Helps you to focus on tasks. Packaging ensures hygienic and fresh capsule each time. 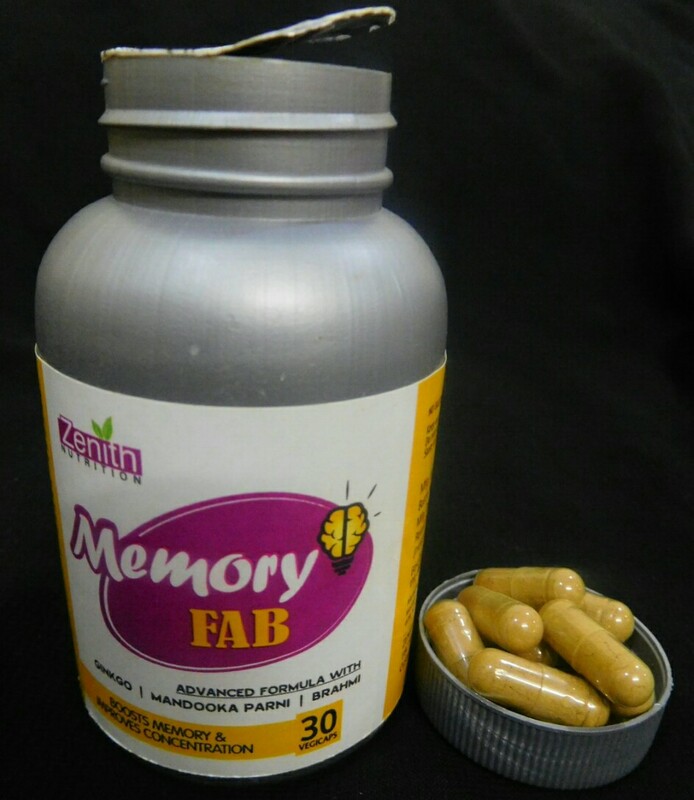 Zenith Nutrition's MemoryFab Capsules are a great option for vegans and vegetarians. They really help a person focus on tasks and even handle multiple tasks simultaneously. It ensures that the brain is boosted. The capsule works effectively and also, hells me to relax therefore avoiding any kind of tension. IBN RECOMMENDATION: I highly recommend it to everyone who tends to forget things and even those who need something which helps them relax.